On May 18 the Longmeadow Veterans hosted Gerry Izzo, CWO4, U.S. army retired and Peter R. Squeglia Jr, a Black Hawk helicopter pilot and Army Ranger from the Battle of Mogadishu. Both participated in the Battle of Mogadishu in October 1993. They spoke of their experiences during the battle of Mogadishu. The battle was memorialized by the movie, Black Hawk Down. They shared with us through a back and forth narrative the many actions in the air and on the ground. That night I learned another meaning of Memorial Day. In the past, on Memorial Day I would pause and remember the day, as a volunteer for the USO, that I helped care for the young family of a fallen soldier. They were waiting for the remains of their loved one to arrive at Barnes Airport. Memorial Day was the look in the little girl’s eyes when she finally realized what they were doing there. Memorial Day has another meaning to me now. I will now also remember that one day a helicopter pilot, after flying 18 straight hours trying to save Rangers trapped in the city of Mogadishu, came back to his quarters to two empty beds and two empty chairs. He knew at that moment his fellow pilots and friends were not coming back. After resting, he got back in the helicopter and flew again. Memorial Day is about our fallen heroes, and their families, their friends, and their comrades. Memorial Day is about the scars on their hearts that will never fully heal. On Friday, sitting in the Longmeadow High School auditorium, I was in the company of two great men. It was an honor I will never forget. 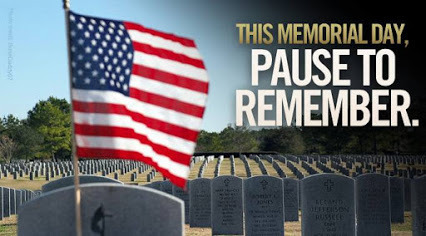 On Memorial Day, I will pause and remember.